From the Department of Neurology, Mayo Clinic, Jacksonville, FL. Antibodies against myelin oligodendrocyte glycoprotein (MOG) have been identified in CNS inflammatory demyelinating disorders (IDDs) including neuromyelitis optica spectrum disorders (NMOSDs) without aquaporin-4 (AQP-4) antibodies. As in NMOSD, spinal cord and optic nerves are 2 of the most frequently involved CNS sites in combined central and peripheral demyelination (CCPD) syndromes.1,–,3 Spinal cord lesions of variable length and abnormal visual evoked potentials with and without clinical optic neuritis have been commonly described in CCPD series and single reports, but AQP-4 antibodies were detected in a minority of patients.1,–,4 MOG antibodies have not been reported in CCPD cases, and their role in CCPD is largely unknown. The clinical relevance of previously suggested antigens, such as neurofascin-155 (NF-155), expressed both in peripheral and central myelin, remains controversial. We present a CCPD case with elevated serum MOG-IgG1 antibodies and suggest their potential role in CCPD syndromes. (A) Gadolinium-enhanced axial T1-weighted MRI of the brain, showing several enhancing lesions in the right pons/middle cerebellar peduncle (trigeminal nerve entry zone), (C) the left periatral region and subcortical white matter of both cerebral hemispheres; and (B and D) at 3-month follow-up, showing resolution of the previously observed contrast-enhancing supratentorial and infratentorial lesions. (E and G) Sagittal T2 short tau inversion recovery sequence MRI of the cervical and thoracic spine, showing a longitudinally extensive lesion from C5 through T1, lesions involving T10-T11 segments, and conus medullaris; and (F and H) at 3-month follow-up, showing a marked decrease in the size of previously observed cervical, thoracic, and conus medullaris lesions. (I) Teased nerve fiber preparation (×16) of the left sural nerve, revealing increased demyelination and remyelination (arrows) and axonal degeneration (asterisks). (J) Semithin epoxy-embedded section (×40), showing moderately to severely reduced myelinated fiber density and rare degenerating profiles (arrow). (K) CD45 (leukocyte common antigen) preparation (×16), showing reactive individual cells within the endoneurium (arrow) and a single small perivascular epineurial collection (not shown). In recent years, some efforts have been made to try to identify antigenic targets and serologic markers in CCPD syndromes. 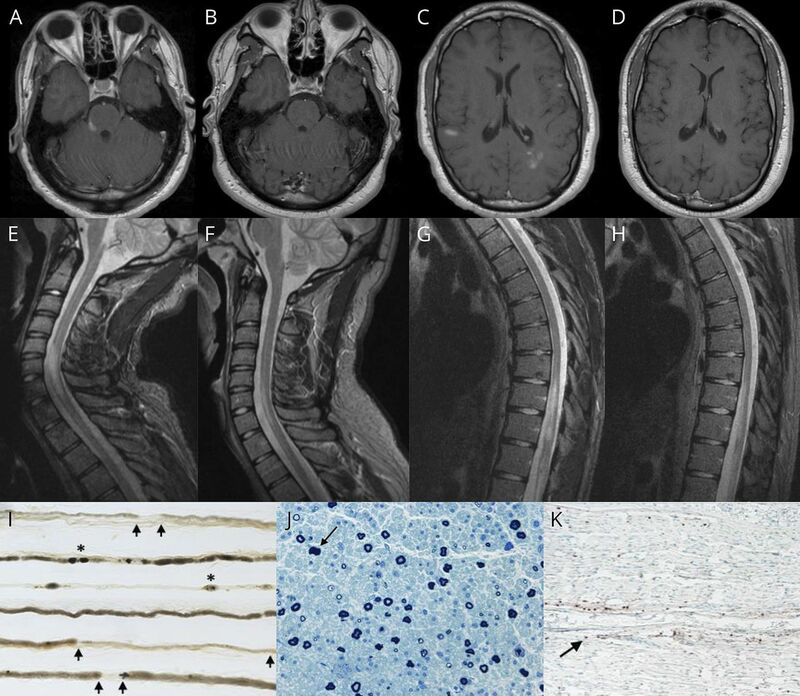 This is a case of confirmed MOG antibody–related demyelinating disease in a patient with CCPD and inflammatory demyelinating polyradiculoneuropathy. Its molecular structure and location on the CNS surface myelin sheath and oligodendrocyte processes predict MOG to be an important target of autoantibodies and cell-mediated immune responses in IDDs. Although the PNS antigen remains elusive in this case, we propose 3 hypotheses to explain the simultaneous CNS and PNS involvement. MOG is found in a secreted isoform, which could be released into the CSF, triggering or “spreading” autoimmunity when drained into the PNS by means of molecular mimicry with peripheral myelin proteins. Although this process would theoretically imply a temporal delay between CNS and PNS symptom onset, a short interval between both cannot be entirely excluded in our patient. In addition, the identification of peripheral MOG expression in rats and primates increases the possibility of an immune response directed to MOG in central and peripheral nerve structures, but this requires further investigations in humans.7 Finally, autoimmune attacks could potentially target nonshared antigens in both CNS and PNS compartments in individuals with an increased susceptibility to autoimmunity. PNS involvement should not discourage clinicians from investigating the presence of MOG antibodies in IDDs. We also propose that MOG autoimmunity may play a role in some CCPD cases. R. Vazquez Do Campo: manuscript concept and design, drafting of the manuscript, editing of the final text, and review of the literature. A. Stephens and I.V. Marin Collazo: patient care, contributed to manuscript editing, and case discussion. D.I. Rubin: critical review of the manuscript, editing of the final text, and intellectual contribution. R. Vazquez do Campo, A. Stephens, and I.V. Marin Collazo report no disclosures. D.I. Rubin served as an associate editor for Journal of Clinical Neurophysiology, receives royalties from UpToDate, the AAN, and American Association of Neuromuscular and Electrodiagnostic Medicine. Full disclosure form information provided by the authors is available with the full text of this article at Neurology.org/NN. The authors thank Dr. Jennifer M. Martinez-Thompson and Dr. P. James B. Dyck (Department of Neurology, Mayo Clinic Rochester, MN) for providing the sural nerve biopsy images and for interpretation of the histological preparations. The Article Processing Charge was funded by Mayo Clinic.
. A nationwide survey of combined central and peripheral demyelination in Japan. J Neurol Neurosurg Psychiatry 2016;87:29–36.
. Combined central and peripheral demyelination: clinical features, diagnostic findings, and treatment. J Neurol Sci 2016;15:182–187.
. The clinical features of combined central and peripheral demyelination in Chinese patients. J Neuroimmunol 2018;15:32–36.
. Possible combined central and peripheral demyelination presenting as optic neuritis, cervical myelitis, and demyelinating polyneuropathy with marked nerve hypertrophy. Intern Med 2018;57:867–871.
. MOG encephalomyelitis: international recommendations on diagnosis and antibody testing. J Neuroinflammation 2018;15:134.
. Association of MOG-IgG serostatus with relapse after acute disseminated encephalomyelitis and proposed diagnostic criteria for MOG-IgG–associated disorders. JAMA Neurol Epub 2018 July 16.
. Myelin oligodendrocyte glycoprotein is expressed in the peripheral nervous system of rodents and primates. Neurosci Lett 2003;350:165–168.